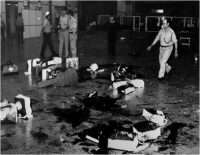 On May 30, 1972, Israeli security at Lod Airport (now Ben Gurion International Airport) was caught by surprise when three Japanese travelers opened fire upon their arrival. Airport security was focused on possible Palestinian attacks. The Japanese Red Army members, who were trained in Lebanon by the Popular Front for the Liberation of Palestine and were casually dressed, were able to get by undetected. The terrorists carried a violin case containing a Czech Vz 58 rifle. They were also armed with grenades and plenty of ammunition. Two of the three attackers were shot and killed during the massacre, the other was wounded and captured, but not before 26 people were killed. Seventeen victims were U.S. citizens from Puerto Rico, one was from Canada, and eight were Israeli. Since 2007 Puerto Rico has commemorated the death of its 17 Christian pilgrims every May 30th on “Lod Remembrance Day”. The identity of the attackers shook Japan. The public did not believe the stories until the Japanese embassy confirmed the nationality of the surviving assailant. Cliff Forster, Public Affairs officer in Tel Aviv at the time, told ADST’s G. Lewis Schmidt about Japanese diplomatic efforts in the aftermath of the massacre and the Israeli reaction in his interview in May 1990. FOR STER: Along about 1972, we could feel the Arab-Israeli tension building up fast. We were very close to some of this, both in Jerusalem and in northern Israel. You had terrorist strikes across the border from Lebanon, a family killed after a bar mitzvah not too far from where we were traveling on the road, which caused great resentment in Israel. Then came the “Munich massacre” as they called it when several of their best team members were killed by PLO terrorists at the Olympics. That had a devastating effect on the Israelis and found them striking back in force. Then there was the capture of the Sabena plane with Israelis aboard by the Palestinians right on the Lod airport tarmac outside Tel Aviv. [Defense Minister Moshe] Dayan personally led the commandos who rescued the passengers. Now, they were really beginning to retaliate in force each time, and the policy made sense to them, since these terrorist strikes were increasing. Next came the Lod Airport massacre, which was a surprise attack by three Japanese “Red Army” or Sekigun terrorists who had been trained in Lebanon. They just opened fire indiscriminately on the passengers after the landing while waiting for baggage in the terminal. The airport was like a battlefield with dead and dying, women and children, everywhere. Those of us involved at the time will never forget the carnage. And many of those victims were Puerto Ricans coming on a pilgrimage to visit the Holy Land, American citizens many of them. Those of us in the embassy went out as pallbearers the following day. The Japanese ambassador and his wife, who were visibly moved by this massacre involving Japanese, went from one hospital to another to visit the victims. Being Japanese, they took personal responsibility and went on television to apologize to the Israeli people. Of course, many of the Israelis couldn’t understand why they should take it so personally since they were in no way responsible. The Japanese sent a delegation immediately from Tokyo to take care of all the claims and this was also immensely impressive to the Israelis.